where is this? very unusually. great shot . This house was on the west end of Galveston Island, before Hurricane Ike. Doubtful that it still exists. Never thought of it as a kettle before. 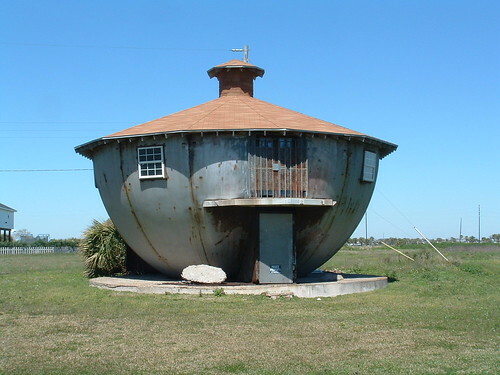 Yes, the Kettle House is still there, in spite of Hurricane Ike. i’ve always liked this house and noticed it every time i was in galveston. Ok, then, anyone know who lives there?? Nobody. I think someone owns it, keeps up with it, but doesnt live in it. I could be wrong, but it seems to never change. I can haz kettle house? 🙂 Love it. http://www.impossibleliving.com , that deals about abandoned buildings. buildings with us, we would really appreciate it !! Nobody lives in that abondoned house but i love to go in that place and see for myself and go inside.Im really curious what inside.Im very much interested. I go to galveston monthly, it is still there, on the West end going out on the Seawall. The house is still there and it has been there before and after Hurricane Ike. Sits all alone and abandoned.